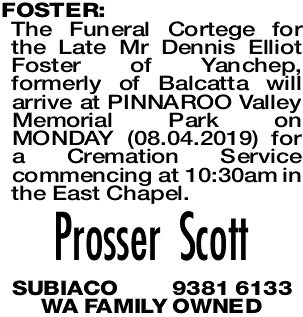 The Funeral Cortege for the Late Mr Dennis Elliot Foster of Yanchep, formerly of Balcatta will arrive at PINNAROO Valley Memorial Park on MONDAY (08.04.2019) for a Cremation Service commencing at 10:30am in the East Chapel. 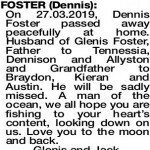 On 27.03.2019, Dennis Foster passed away peacefully at home. 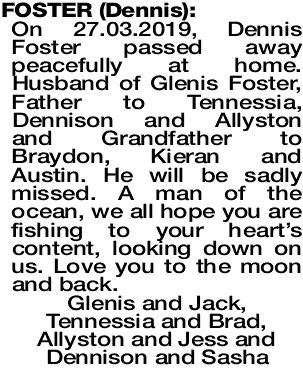 Husband of Glenis Foster, Father to Tennessia, Dennison and Allyston and Grandfather to Braydon, Kieran and Austin. He will be sadly missed. A man of the ocean, we all hope you are fishing to your heart's content, looking down on us. Love you to the moon and back. In loving memory of my brother Dennis who will be sadly missed. Deepest sympathy to Glenis, Tennessia, Dennison and Allyston and families. Murray, Shelley and families. RIP. 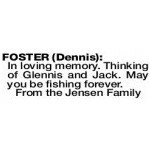 FOSTER DENNIS In loving memory. Thinking of Glennis and Jack. May you be fishing forever.